A gas leak in Chicago's Loop halted CTA service on the elevated tracks and blocked traffic late Thursday morning. 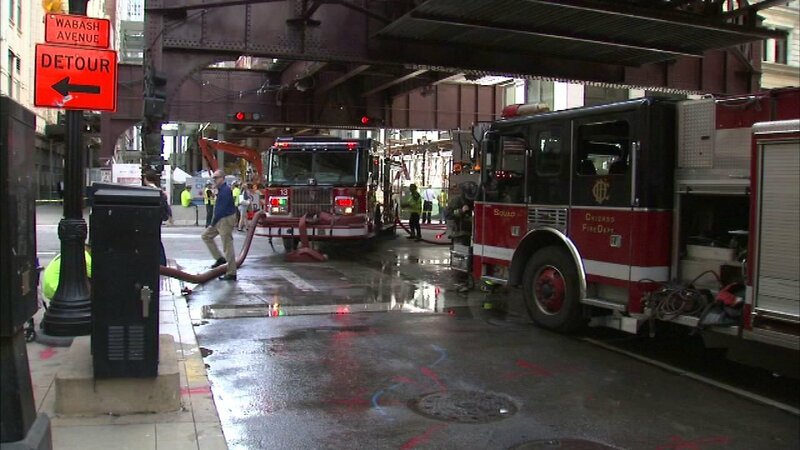 CHICAGO (WLS) -- A gas leak in Chicago's Loop halted CTA service on the elevated tracks and blocked traffic late Thursday morning. A Level 1 hazardous materials response was called to North Wabash Avenue between Washington and Madison streets just before 11:20 a.m. Chicago Fire Media said a construction crew struck a high-pressure gas line under Wabash. CTA Brown, Green, Orange Purple and Pink line trains were stopped on the elevated tracks near the Adams/Wabash station. Trains were later rerouted to accommodate passengers. The fire department asked for elevated CTA service to be shut down as a precaution against sparks and for traffic in the area was blocked. Officials from the gas company were also on the scene. Firefighters capped the leak and secured the Level 1 hazmat around 11:55 a.m. No one was injured.